When done right, farmhouse style can have a touch of the luxe without being stuffy. With details like soft white paint, pitched ceilings and a kitchen large enough to house a harvest, this elegant home has the style of a farmhouse mixed beautifully with luxurious amenities. Light and airy, the wide archway has enough room for lovely built-in bookshelves and extra storage cupboards. Added trim work on the archway ceiling mimics the painted beams in the living space just beyond. Rich, honey-colored wood flooring is patterned with grainy contrasts. With natural accents, like woven fiber blinds, sea shell accessories and a fawn linen lampshade, the living room promotes a restful retreat. Photo by Dovetail Renovation, Inc.
On the other side of the archway sits the formal dining room. Curved, upholstered dining chairs have a Swedish country charm. Using the full length of the wall, a built-in buffet houses glassed cabinets showcasing crystal stemware. 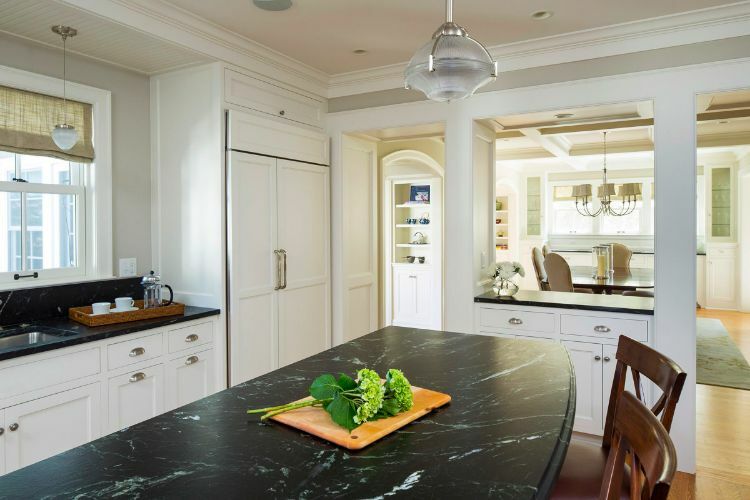 Not just for kitchens, the use of granite on top of the sideboard is a unique and elegant design element for the dining room. 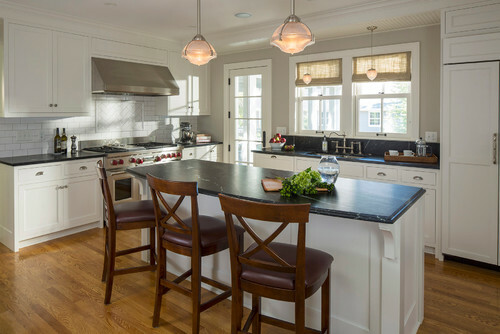 Chopping fresh herbs and splashing tangy oils are just some of the cooking delights you can enjoy in this bright kitchen with marbled black stone countertops. Sweet, ripe apples lend a touch of red just like the knobs of the gourmet chef's range, with a double oven and six-burner range. 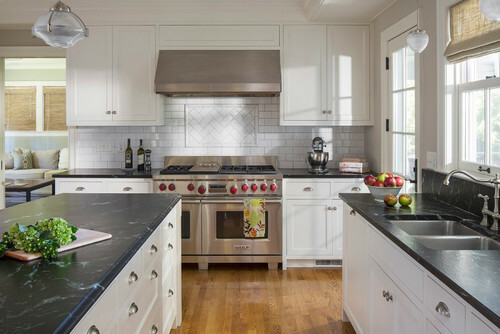 Stylized subway tile is framed below the stainless steel hood, with a more traditional pattern of the same tile creating an easy-to-clean backsplash. Shaker cabinetry — the embodiment of farmhouse kitchen design — is used to blend the refrigerator in with the rest of the cupboards. A French door leads outside. Again, the use of wide room dividers adds a richness to the home. Here, the kitchen meets the dining room through an elegant pass-through — entertaining made easy. A generous and airy butler's pantry is a modern homeowner's storage center as well as a cleanup and prep area. 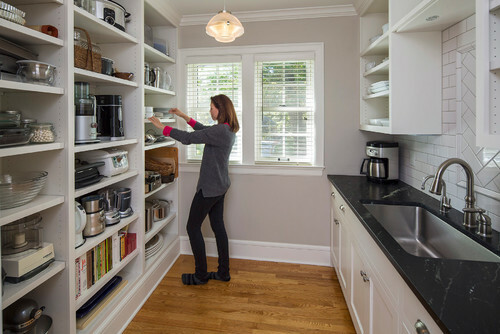 Open shelving makes it easy to spot appliances, store large tableware and contain a full collection of cookbooks. 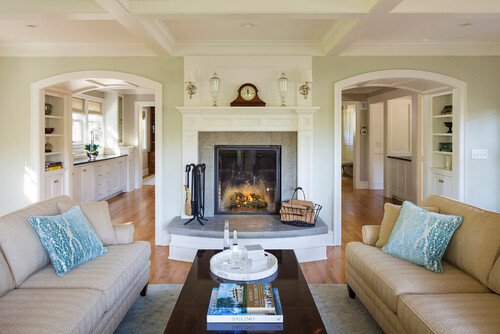 The heart of this elegant country home is the turn-of-the-century-inspired fireplace and mantel. 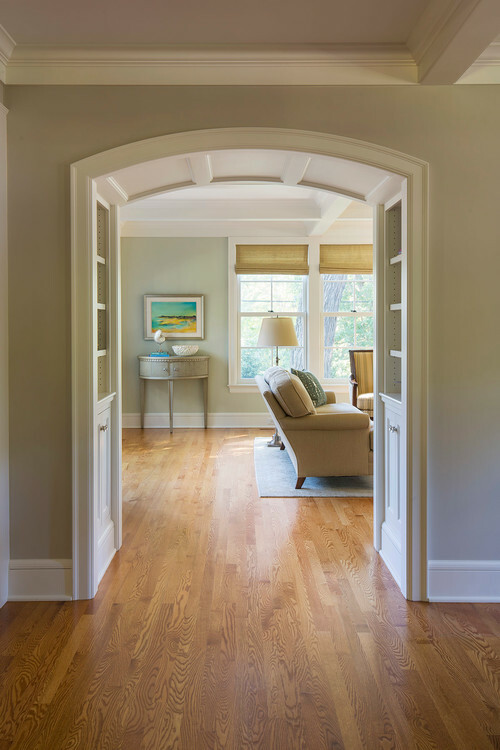 Gazing into both arched hallways, storage and displays are tucked into the built-ins. An antique mantle clock is book-ended with crystal jars and bronze sconces. Soft green-apple paint creates a soothing picture with pops of retro velvet throw pillows adding just a touch of plush style. 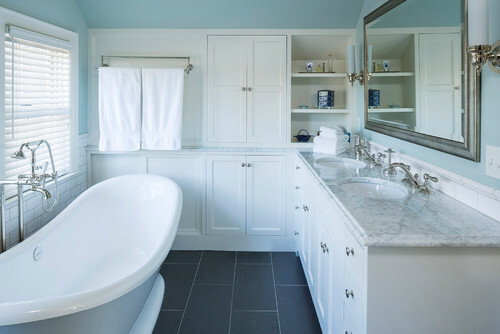 Soothing and sophisticated colors continue in the cerulean blue bathroom, which boasts a soaker tub angled at each end, promising long, hot soaks. Built-in storage cabinets are cleverly tucked under the tilt of the roof. 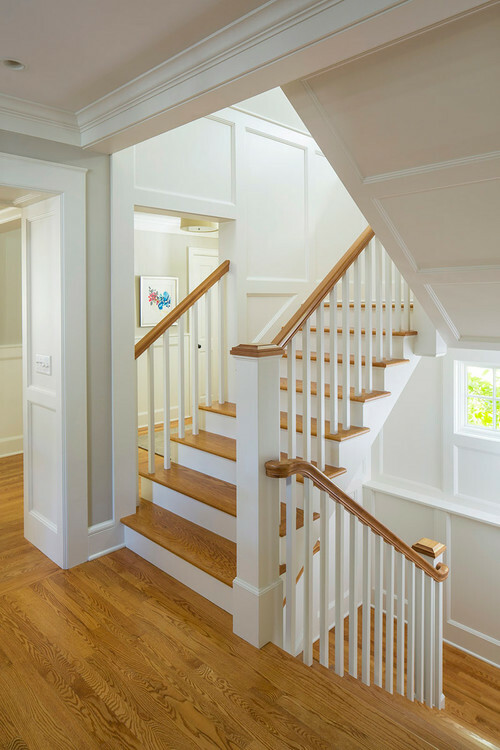 Wider than typical walkways are found again near the stairwell, open to the hall to keep the space airy, with site lines to multiple areas of the home. 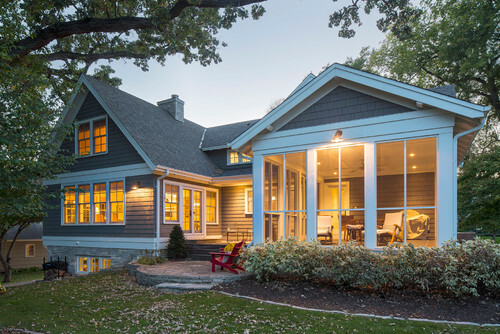 As dusk settles in, warm lighting highlights the slate clapboard siding. A peek into the screened-in porch suggests the evening can be prolonged a bit, with sweet breezes and soft sounds to gently bring the day to its end.